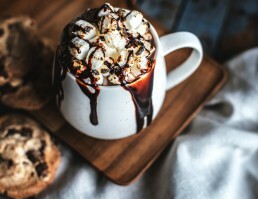 The chocolate charm will make every detail of your secial day tastier: cocoa pods on the tables, chocolate treats as seat markers, steaming mugs of hot chocolate to go along with nice conversations, chocolate-scented invitations and a warm and enchanting palette of colors. 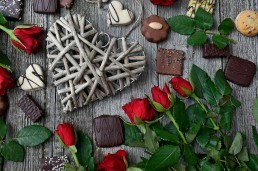 Specialties made with chocolate will be part of the menu: from pasta to fish, chocolate is widely used in cooking, either for dessert or savory recipes. However, the highlight of a chocolate-themed wedding is –obviously- the sweet table. With to without a chocolate fountain, here are our tips for the sweet table of a chocolate-themed wedding. Even though the most traditional brides won’t renounce to the classic sugar-coated almonds Bianchi d’Avola, it goes without saying that at a chocolate-themed wedding the party favours should be filled with chocolate. At Papa Confetti, we have many different chocolate-filled party favours, such as the Double Chocolate & Fruit collection and the colorful Cioccogolosi. Those who want to have an original, trendier sweet table can add some chocolate macarons, perhaps shaped as a wedding cake, or some exotic chocolate bars.